This beautiful and thornless Palo Verde hybrid has three parent plants to thank for its features: Parkinsonia aculeata, Cercidium floridum, and Cercidium microphyllum. ‘Desert Museum’ is a fast growing large shrub or small shade tree. Plants grow into an upright vase-like shape. 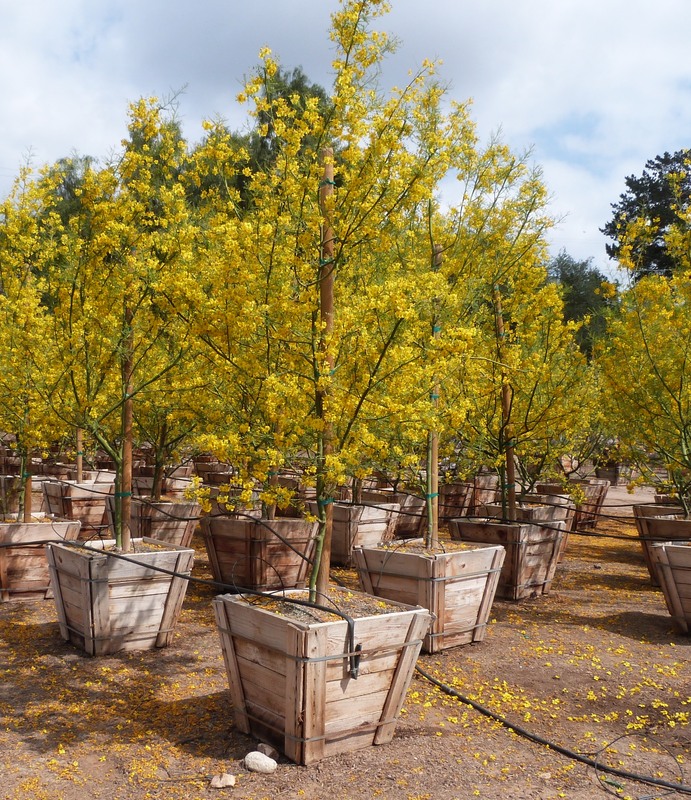 Large yellow flowers provide a dazzling display of color in spring, lasting longer than any other Palo Verde species. Trees may re-bloom in summer if given some supplemental water. Because this is a sterile hybrid, the trees do not produce messy seed pods. Foliage is small and dense along the branches but will still allow some sunlight to reach plants planted beneath. While it is semi-deciduous, the trunk and branches remain a rich green, offering another season of interest. Works very well as a specimen plant and focal point in the landscape. Prune minimally to keep excessive branch growth to a minimum. Occasionally thin overgrowth to keep a pleasing form. Plants thrive in full sun locations and are drought tolerant once established.